The US is "deeply concerned" about the death sentences Egypt handed down to 529 Muslim Brotherhood Islamists on Monday, according to AFP. "We continue to call on the Egyptian government to ensure that all those detained in Egypt are afforded fair proceedings that respect civil liberties and due process and are consistent with international standards. The law must be applied equitably and free of political bias." 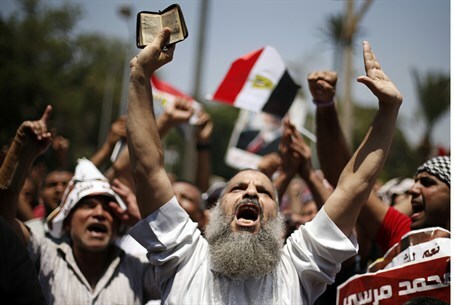 "We have said many times that even the appearance of politically-motivated arrests, detentions, and convictions will set Egypt's transition back," the official added, saying violence would not prevent more Islamist violence. US law forbids sending aid to countries where a democratic government was deposed by a military coup, though Washington has never qualified Morsi’s ouster as a "coup" and has been cautious about doing so, choosing only to condemn the violence in the country. Recently, the US has considered resuming aid to Egypt, despite concerns over an essential American value - freedom of the press - since the ouster.